With Valentine’s Day fast approaching, now is the time to get your gifts sorted! At ilovewine.com we’ve selected some of our favorite Valentine’s Day gift ideas. These products are perfect for surprising the (wine) lover in your life. Get your gift inspiration from this ‘Best Valentine’s Day Wine Gift’ selection and order your favorites soon. Have fun browsing and pampering that special someone (or yourself!) on the 14th of February. Tip: For more Valentine’s Day Wine Gift inspiration, check out our other guides on the Best Wine Gifts, Best Wine Tumblers, and Best Wine Cork Wall Decor. The ‘Wine Tasting Is My Sport’ shirt by Vintage Wine Lovers is a great gift for men who love their vino. Express your passion for wine by wearing it out and proud. The shirt has a retro style print and matches with the current trend for vintage graphic tees. Made of soft cotton, the shirt is comfortable and lightweight. It has a classic fit and double-needle hem. Suitable for machine washing and dry cleaning, its ideal for everyday casual wear. 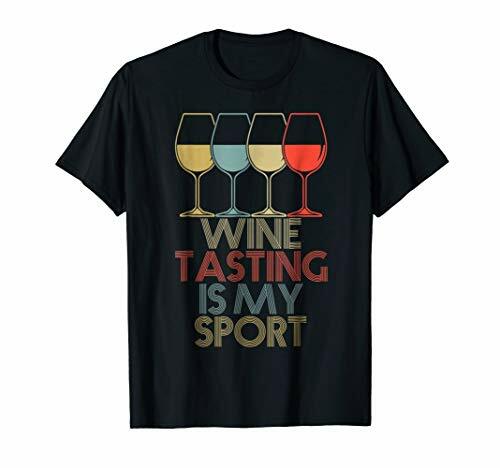 The ‘Wine Tasting Is My Sport’ shirt is available in male sizes Small to 2XL. It also comes in 5 colors: Black, Navy, Royal Blue, Brown, and Dark Heather. With that many sizes and hues, there’s a right match for every man! This glass tumbler by C&M Personal Gifts makes an original present for a wine lover that also loves dogs! The sleek, stemless tumbler is made of quality glass. It’s engraved with a funny, ‘inspirational’ quote. 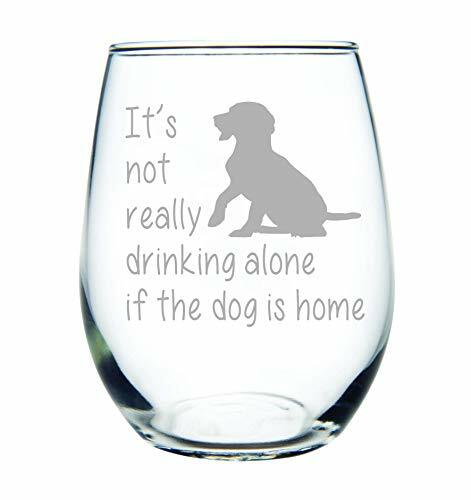 ‘It’s not really drinking alone if the dog is at home.’ The design also features an engraving of a dog silhouette next to the quote. Affordable and cute, this tumbler is ideal for everyday usage. The engraving is permanently etched on the glass surface, meaning it is dishwasher safe. The tumbler holds 15oz of your favorite wine and is also available in a stemmed version. LOL CONVERSATION STARTER! - Enjoy a relaxing evening with your new favorite stemless wine glass, which reads Best Cat Mom Ever. Holds 15 ounces of your favorite white or red vino. 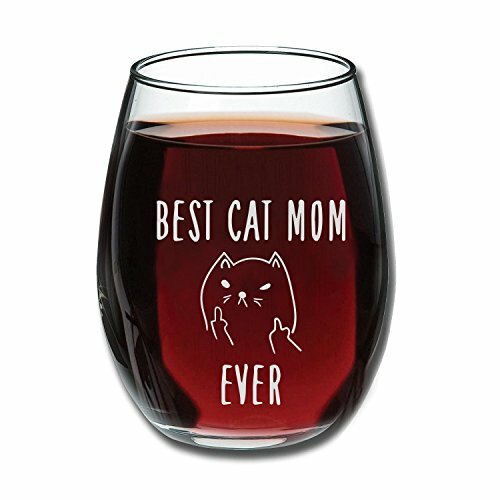 The ‘Best Cat Mom Ever’ wine tumbler by Gelid is the ultimate way to showcase your love of cats. Very original, a bit rude and definitely an eye-catcher. It’s a must-have Valentine’s Day Wine Gift for all cat moms. The glass itself features the text ‘Best Cat Mom Ever’, enhanced further by a cartoon outline of a cat. Not just any cat. This cat is flipping its finger, sorry, we mean paws. If you love sarcasm and rudeness, you’ll adore this one-of-a-kind tumbler. The design holds 15oz of your favorite wine and has a classic, perfectly balanced silhouette. The makers have printed it with a premium ceramic ink, ensuring it never fades or loses its shine. Durable for long-term usage, you’ll get plenty of sips (and laughs) out of this unique gift! Did someone say: ‘WINEOPOLY?’ Yes, this board game is exactly what you think: the classic board game, now in a special wine-themed version. Brilliant! We wish we would have thought of it and could take the credit, but makers Late For The Sky pipped us to the post. WINEOPOLY is the ultimate Valentine’s Day Wine Gift for the board game lover in your life. The game is similar in set-up and rules as the original but has replaced the property with wine. Instead of buying houses, you’re buying wines, collecting grapes and trading them for decanters. Mix in some pesky import taxes and wine serving mistakes, and the game can be just as frustrating (yet fun) as the property-version. The playing cards also contain fun wine trivia and facts, meaning the game is entertaining AND educational! Learn whilst you play! 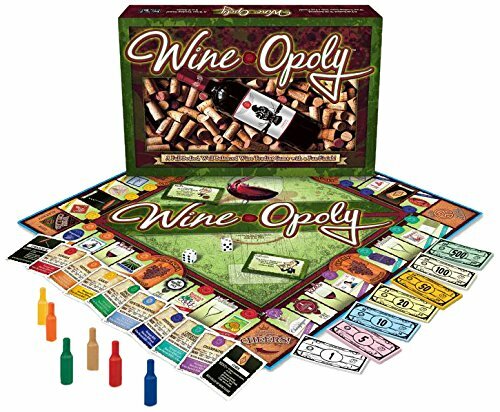 The WINEOPOLY kit includes everything needed to play, included a game board and even wine-themed playing tokens. Will you pick a wine bottle, cork, wine glass, cheese, grapes or a carafe to traverse your way to victory? WINEOPOLY is suited for 2 to 6 players and offers traditional gameplay and a speedy 1-hour gameplay option. So, what are you waiting for? Order it now and get playful this Valentine’s Day! WINE CONDOMS: This protective wine covering was Invented by a mother son duo, inspired by a Macgyvered wine seal that looked like a makeshift condom. Unaware of the success that would come from this hilarious, yet effective solution to resealing opened bottles of wine, they set out to create this fun novelty gift. With a bigger is better mentality (pun intended), the newly upgraded wine condom version 2.0 is the ultimate in wine protection and preservation. 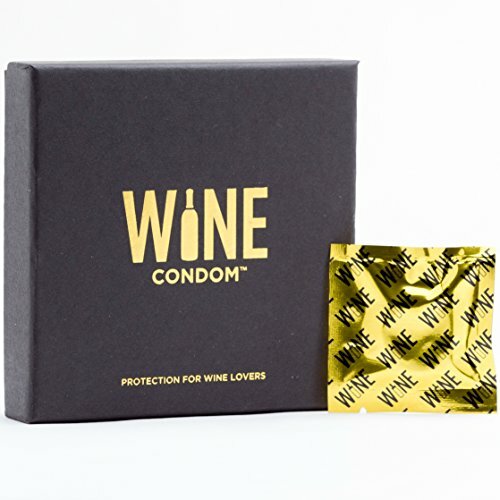 If you’re looking for a funny, humorous gift to surprise a wine lover this Valentine’s Day: the Wine Condoms pack is it! No, the only sexual thing about these is the innuendo. They are actually to protect your wine. Funny and practical: these wine condoms will make you laugh AND keep your wine ‘fresh’ longer. Simply slip a stretchy wine condom over the neck of the bottle and you’re done. The wine condoms feature a special ‘shrink-to-fit technology’. This allows them to create an air-tight seal on almost any sized bottle. By creating this air-tight seal, you are able to keep the oxygen out, preventing your wine from spoiling. Seduce that special someone in your life with an intense session of wine preservation and order this cheeky Valentine’s Day Wine Gift today! 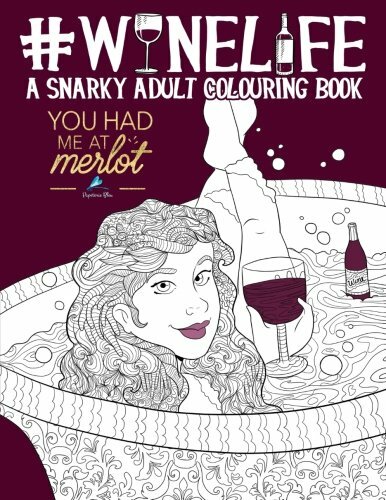 The Wine Life: A Snarky Adult Coloring Book is an amazing gift for the creative spirit. If you love getting your arts & crafts on, why not combine it with wine? This coloring book allows you to release your inner Picasso, whilst providing plenty of laughs with its snarky adult humor. The coloring book encourages you to ‘unwin(e)’ in a creative, unique way. The book contains fun prints, perfect for all coloring types (pencils, paint etc.) It’s printed single-sided on white paper with black background reverse pages to prevent color bleed-through. The dozens of intricate drawings all have a wine-theme. Funny, affordable and certainly original, the Wine Life: A Snarky Adult Coloring Book is a fun choice to celebrate your love for wine in a super creative way this Valentine’s Day. Irresistible Starry Night Color - Inspired by the night sky, this warm black color with light gold accents is sophisticated and elegant. This collectible piece has a hue that seamlessly fits any space and occasion. Do you really want to splurge this Valentine’s Day? Then treat a loved one to a state-of-the-art Coravin Wine Preservation System. The ultimate luxury in wine accessories, it’s a ‘big celebration’ kinda gift. 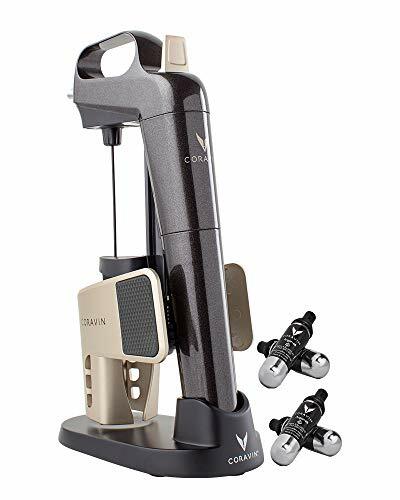 A Coravin Wine Preservation System allows you to pour wine from a bottle, without removing the cork. The device then creates an air-tight vacuum seal using argon gas, preserving your wine for weeks, even months. This means you can have a glass, without committing to drinking the entire bottle straight away. The state-of-the-art Coravin Wine Preservation Systems are available in a variety of models. The Model One is the basic model, the Model Eleven the most elaborate. We’re particularly fond of the Limited Edition Model Two Elite Pro in the color combination Starry Night. It has a beautiful gold/black hue and features luxurious chrome-accents. Stylish and functional: it’s a wine lover’s ultimate luxury purchase. So, if you really want to go all out this Valentine’s Day, why not invest in a wine preservation system that will last you forever? Less wine spoiled, more wine enjoyed. It might be pricey, but nothing says ‘I love you (and wine)’ better than one of these beauties! For more inspiration on your options, check out our in-depth guide on Coravin’s products. 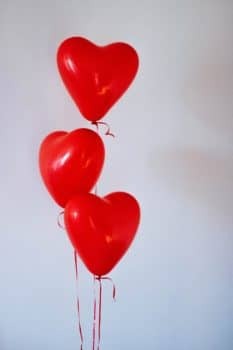 Tip: For more Valentine’s Day Wine Gift inspiration, check out the other ilovewine.com guides on the Best Wine Gifts, Best Wine Tumblers, Best Electric Wine Openers, and Best Wine Cork Wall Decor.